After months of planting, caring, watering and loving, here are some of the fruits of our labor. 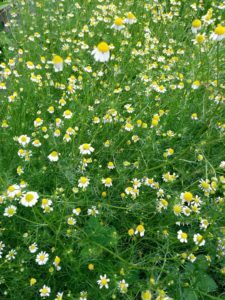 From the tinest of seeds springs the lovely Chamomile (Matricaria chamomilla). The flower is sweet scented and delightful as a tea to calm your stomach and help you sleep. 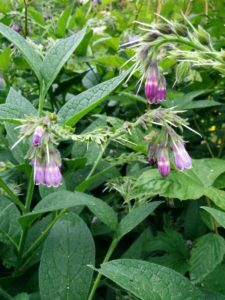 The prolific Comfrey (Symphytm offocinale)grows abund antly without help on the farm and appreciative of being cut back to allow new growth . The leaves and root are dried to be infused in oil to make healing salves for cuts, bruises, sprains or poulticed for aching muscles and even broken bones. The beautiful, bountiful, medicinal plants are so loved by the bees and butterflies and harvesting is a careful process that ensures ample reserves for our pollinator friends . At last count I have over 50 medicinals growing in my gardens and more wild herbs around the 6 acre herb farm. For specific medicinal plant info, please email me at powerfarm@mail.com.